Admitted into Active membership in 2002, she has served as VP of Finance and Treasurer. She has chaired the 2012 Christmas Fair, Advisory and Strategic Planning, Endowment Fund Development, El Paso Ambassadors, Christmas Fair Merchants, Christmas Fair Finance. She has served on Placement, Nominating twice, Community Research, a Christmas Fair Auction and as Keystone Botanical Garden Treasurer. Diane has been a delegate to the West Texas Board Meeting, and Annual Conference. Diane was inducted into the El Paso Women’s Hall of Fame in 2013 for outstanding work in Civic Leadership. 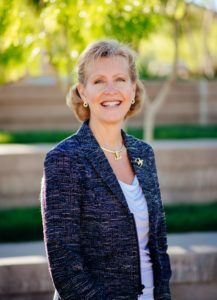 Diane Flanagan is the Chief Executive Officer of the Girl Scouts of the Desert Southwest, and holds a Master of Business Administration degree from Northwestern University’s J.L. Kellogg School of Management and a Bachelor of Engineering degree in Mechanical Engineering from Vanderbilt University. She is currently involved in our community through the University of Texas at El Paso President’s Athletic Advisory Committee, the El Paso Women’s Executive Forum, Region 10 (Texas, Oklahoma, Arkansas) Representative to the National Catholic Committee for Girl Scouts and Campfire, a member of the National Federation for Catholic Youth Ministry, Girl Scouts of the USA National Pension Advisory Committee. Diane has two sons. Kevin attended Vanderbilt University and resides in Austin. Ryan attended Texas Christian University and resides in Dallas. Diane enjoys attending UTEP football and basketball games, El Paso Symphony, El Paso Pro Musica, and UTEP Dinner Theatre events, and has proudly completed Disney Coast to Coast marathon and the half marathon in 2014.